How does architecture become computational? In other words, a discipline where computation is not exceptional, but rather, a common practice. We believe that the success of this transformation rests on something much greater than the adoption of a particular level of vocational skill. It requires a cultural shift. Our values, attitudes, and beliefs regarding design must change. As education is one of the primary instruments of implementing disciplinary culture, we propose an examination of the topic through the lens of pedagogy. How do we arrive at the point of integration, when architects understand that computation is not just a tool for helping design, but a way of doing design? When all designers --not only specialists-- can practice computationally and ruminate on the subject? Our goal is to examine the state of thinking on the matter, tracing possible trajectories and delineating obstacles on the way to making computation not the exception but a normative part of our profession. The premise of the Design Computation Dual Degree Program is that design has become increasingly important to computer scientists and at the same time computation has become important to designers. This program is a unique curriculum that systematically combines the strength and insights of each discipline. The curriculum integrates Computer Science/SIS and Architecture students and faculty working collaboratively on tasks that challenge both fields. Early in the curriculum, the cohorts with architecture background and those with computing background will be taking courses to provide basic competency in a new discipline. As computing has matured as a discipline, it has expanded its focus to include the physical and virtual settings in which users interact with the machine. Specialties like human computer interaction, ubiquitous computing, gaming and visualization require an understanding not only of the logic of the machine, but also the logic of the user. Based on these concerns, the design thinking ability that is an integral part of design training is of interest as an alternative paradigm that may change the way that students think and operate. Within architecture, there is a unique opportunity to develop students who will have the knowledge to lead the integration of the computer into architectural practice and research. As firms rely more and more on computation, those who know how to think, program and script will be able to change the way architects design and practice. We see the day fast approaching when the IT department at firms is not separate but rather is at the core of what architects do. Already, in advanced practices across the world, computing and design are completely intertwined. 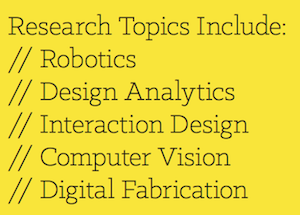 UNC Charlotte has a variety of facilitates associated with this program including an advanced Digital Fabrication Lab including a KUKA KR-60 Robotic Arm, an Interaction Design Lab, the UNC Charlotte Visualization Center. Research Assistantships (including tuition and a stipend), as well as other forms of financial support for students, are available. Eligibility for financial support will be by recommendation of the admission committee. NOTE: Other programs within the School of Architecture are accredited through the National Architectural Accrediting Board, but the Master of Science in Architecture degree program, because of its research focus, is not an accredited program and can not lead to licensure as a registered architect. Initial Application Deadline January 15, 2019 for primary funding opportunities. Final Deadline August 1, 2019 if spots remain. Industry partners include: Autodesk, Electrolux, and a range of National design firms.